Fans of distant history will relish in discovering Cartagena’s Punic wall, which dates back to the 3rd century BC. 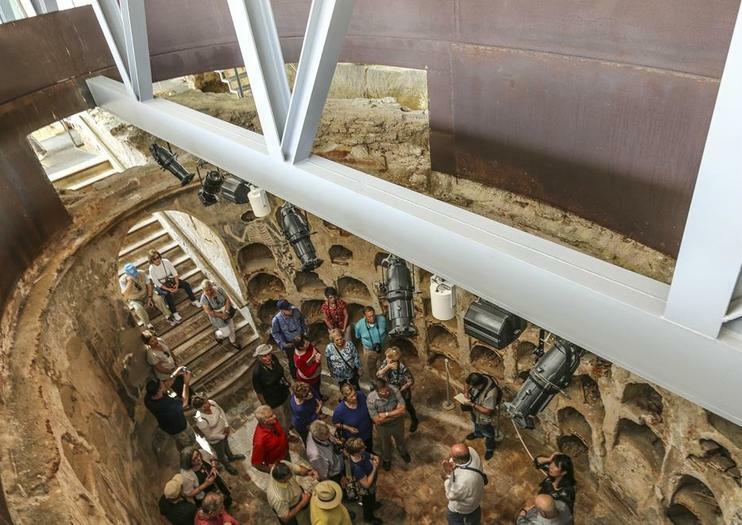 To explore its remains, head to the Punic Wall Interpretation Center, where you can not only see a portion of the salvaged structure (which is protected within the center) but also learn about its storied past. The wall, of which 30 meters have been excavated, served as a city-surrounding defensive fortification built by the Carthaginians. The goal was to protect against Roman attack during the Second Punic War (though it ultimately failed). Apart from viewing the wall, you can also get up close to a later crypt, and learn more about it all via the center’s informative video and display boards. While the museum and archeological remains are rather small in size, the history is big, making it an intriguing visit for those keen to learn more about these ancient times. The wall and interpretation center are located just a short walk from the main tourist center. Several bus lines stop in nearby Plaza Bastarreche. The Museum of Modern Art is situated just a few blocks away. Hours: July 1st to Sept 15th: Mon-Sun, 10:00 a.m.-8 p.m. March 15th-June 30th: Tues-Sun, 10:00 a.m.-7 p.m. Sept 16th-Nov 1st: Tues-Sun, 10:00 a.m.-7 p.m. Nov 2nd-March 14th: Tues-Sun, 10:00 a.m.-5:30 p.m. If you’re docked at Cartagena, explore the surrounding areas on this 5-hour private shore excursion. Learn about the history of the area as you explore the Punic Walls and the take in the views from the Conception Castle. Drive to the “La Manga”—the portion of land that juts into the Mediterranean—and visit the Cabo de Palos Lighthouse for panoramic views of the sea.